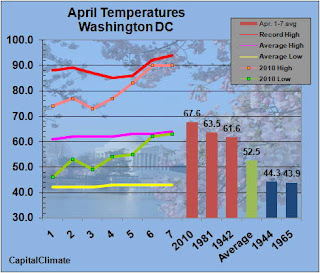 In the records of Dulles Airport dating back only to 1962, this year's April 1-7 average of 67.7° smashed by over 7° the previous record of 60.4° in 1988. It was also the warmest first week of April in Baltimore. 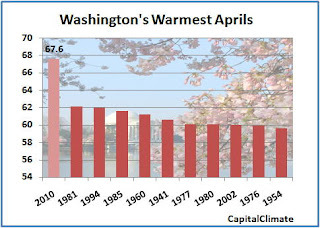 April 8, AM Update: This morning's low of 69° is 9° above the record warm minimum for April 8. In the unlikely event that this reading were to hold through the approach of a strong cold front this evening, it would tie the all-time April warm minimum on April 19, 1896. This morning's low of 67° is 14° above the current record of 53° set in 1983 and is 1° above the all-time April record warm minimum of 66° in 1977. Following a low of 63°, the Washington, DC noon temperature is now up to 79°. 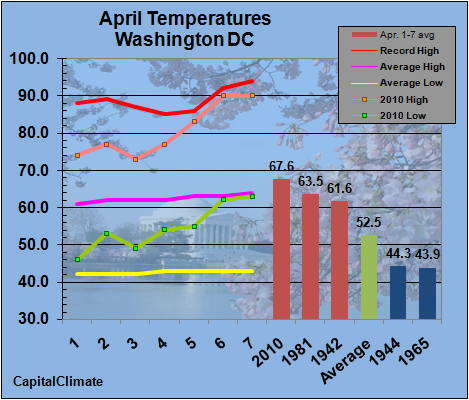 This clinches a record high average temperature for the first week of April since at least 1930, when records began at or near the current location of National Airport. With an expected high in the upper 80s, the average for April 1-7 will be close to a remarkable 4° above the previous record in 1981. For previous history, see the earlier post below. 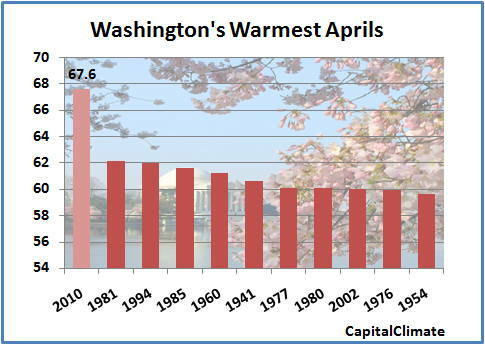 Washington DC temperatures continue on a pace to break the 80-year record for the first week of April with a reading of 80° at 2 pm today. Details below. The recent early April warmth in the eastern U.S. has extended well into northern New England this weekend. 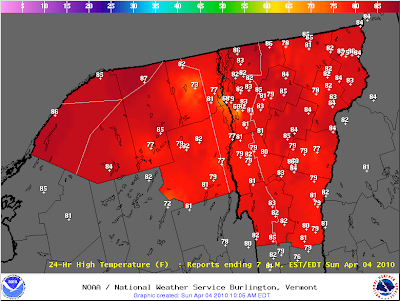 On Saturday, Caribou, Maine utterly demolished its daily temperature record for April 3 with a high of 82°. 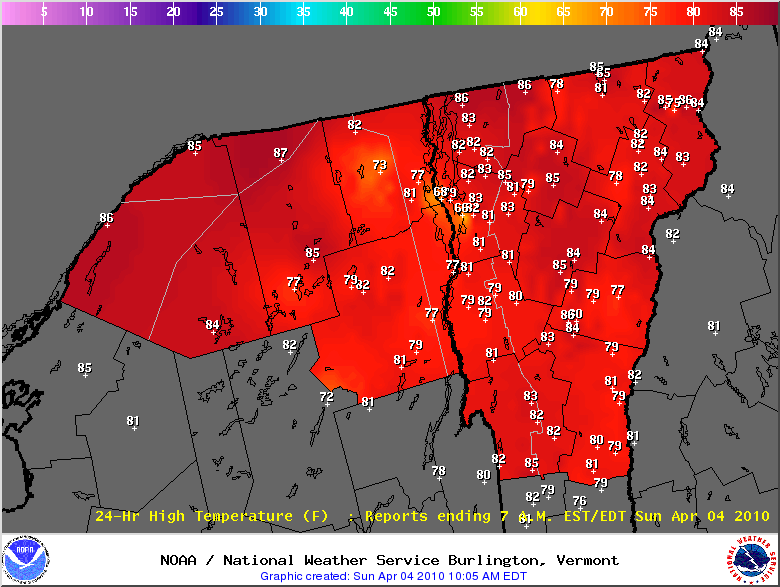 This smashed the old record of 58° by 24° and exceeded the long-term average by an astonishing 41°. For an equivalent low temperature record to be set, it would have to be as cold as 17° below zero. The low for the day of 43° was 2° above the normal high. Climate records at Caribou date back to 1939. Caribou followed this with a more modest reading of 73° today, breaking the 1987 record of 62°.